Mid 19thC Art Glass Paperweight w/ Lattice & Canes! 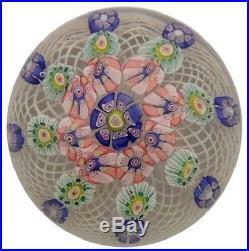 This wonderful early art glass paperweight is decorated with colorful cane designs on a white lattice background. It has a polished pontil on the base and shows nice wear. It dates from the mid 19th Century and measures approximately 1 + 7/8 inches tall by 2 + ¾ inches across. It is in excellent condition with no chips or cracks, just some light surface scratching. Important Notice for International Customers. The item “Mid 19thC Art Glass Paperweight with Lattice & Canes” is in sale since Tuesday, May 23, 2017. This item is in the category “Pottery & Glass\Glass\Art Glass\Paperweights\Vintage”. The seller is “coasttocoast_antiques_nh” and is located in Newport, New Hampshire. This item can be shipped worldwide. Mid 19thC Art Glass Paperweight w/ Lattice & Canes! 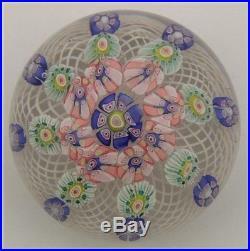 This wonderful early art glass paperweight is decorated with colorful cane designs on a white lattice background. It has a polished pontil on the base and shows nice wear. It dates from the mid 19th Century and measures approximately 1 + 7/8 inches tall by 2 + ¾ inches across. It is in excellent condition with no chips or cracks, just some light surface scratching. Important Notice for International Customers. The item “Mid 19thC Art Glass Paperweight with Lattice & Canes” is in sale since Friday, April 21, 2017. This item is in the category “Pottery & Glass\Glass\Art Glass\Paperweights\Vintage”. The seller is “coasttocoast_antiques_nh” and is located in Newport, New Hampshire. This item can be shipped worldwide.